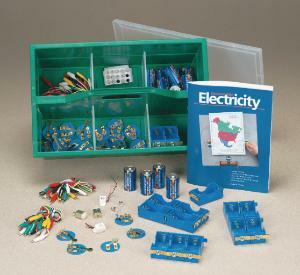 Complete electricity kit in a convenient storage case. Complete classroom set of basic electrical components designed with both quality and economy in mind introduces both student and teacher to simple electricity concepts and the electrical properties of matter. The Electricity Teacher’s Guide contains activities for designing and building simple circuits, switches, series and parallel circuits, motors and buzzers. Packaged in a convenient CaddyStack. Includes 15 each Economy Bulb Holders, Battery Holders, Economy Switches, D Batteries, Mini Bulbs; two Motors, three packages of 10 Wire Connectors, two Buzzers, and the teacher’s guide. Caution: CHOKING HAZARD- Small Parts Not for Children Under 13 Years.